A few years ago I was watching a Dr. Phil episode and I was stunned by how he compared a woman to a blackboard. He stated that a woman’s reality is shaped according the kind of things other people write on her board during her lifetime and the ones that she writes for herself. During that segment, Dr. Phil was interviewing a couple that was having serious marital problems, and he was explaining that even though that woman had good feelings, and good intentions, she was a bad fit for her spouse because she was very damaged by all of the negative things she already had in her blackboard. Even though I believe that we all are good by nature, I agree with the concept of someone being too damaged. Sometimes, we surround ourselves with negative people who keep gradually damaging our being. Some of these people could be family, friends or partners, but their impact is true and could be severe. I also believe that no matter how much damage we have suffered, there is always an opportunity to reinvent ourselves and rewrite our story. That day, while I was still in front of the TV, I felt sorry for that woman because I thought her damage was severe. The analogy of the blackboard made me think of all moms like you that are victims of financial abuse. I started thinking about the negative things that may have been written in your board, then I recalled that, in my childhood, my grandma used to say that I was bad, and from time to time she would emphasized that by saying I was the evil itself. My grandma passed away a few years ago, and her hurtful words and gestures are vivid in my mind, and even though they made me feel bad when I was a kid, they were harmless to me because I had my mom, encouraging me and letting me know how good and blessed I am, so I decided to trust my mom’s opinion. Those words were like bullets to me. They made me feel sad for my friend because I believe nobody deserves to be treat that badly. It also made me feel sad for her mother because I couldn´t understand how someone could blame her own child, and I thought that if a mother could do this, anyone could do that too. I wish none of this phrases to be written in your blackboard. I wish I was wrong. This sad feeling left me eager to know more about you. To better understand how the people in your life have written—either with words or experiences—in your blackboard, to shape who you are now. And I started wondering: What if there is a profile for moms victims of domestic financial abuse? With more than 5 years of experience conducting surveys for private companies, my first reaction was to find a paper or a study where I could get to know that profile. Sadly, financial abuse is one of the forms of domestic abuse less studied and almost unknown for many Americans, so I couldn’t find any profile. Having found nothing that helped me understand the victims of financial abuse a little more, my wonderful coach Elayna Fernandez suggested to conduct a survey. I was excited with the idea of conducting a survey, so I started to work on it. In my preliminary research I found that there are many theories that support the impact of the external factors in your personality, such as the parenting style and the environment. Researches also say that they affect your relationship in certain situations. Conducting the survey will not only help to identify if there is a profile for women victims of financial abuse, and understand why moms are like they are, but to help you and other moms to find ways to improve your parenting style in order to help your daughters prevent financial abuse from happening in their lives. You could also identify whether an environment is negative for your daughter. To know the remarkable impact a woman can have from their parents and the environment is a step forward that can help our daughters to be less vulnerable by strengthening their weaknesses. Many people have had a huge impact in my life. My mother’s positive and optimistic attitude, has taught me the power of words and how we can change our situation just by changing our mindset. I’m grateful for having her and lots of encouraging and supportive people in my life, who made invisible the negative writings in my blackboard. I hope your blackboard is healthy and that your life is full of positive and encouraging people that help you balance the negative words some people may write on it. But if you are not happy about the way your blackboard is looking, you always have the chance to start designing your dream life now. A good beginning for that new you could be to intentionally avoid the toxic and negative people in your life. It´s healthy to seek for people that value who you are and appreciate your worth, people that believe in you and inspire you to be better. 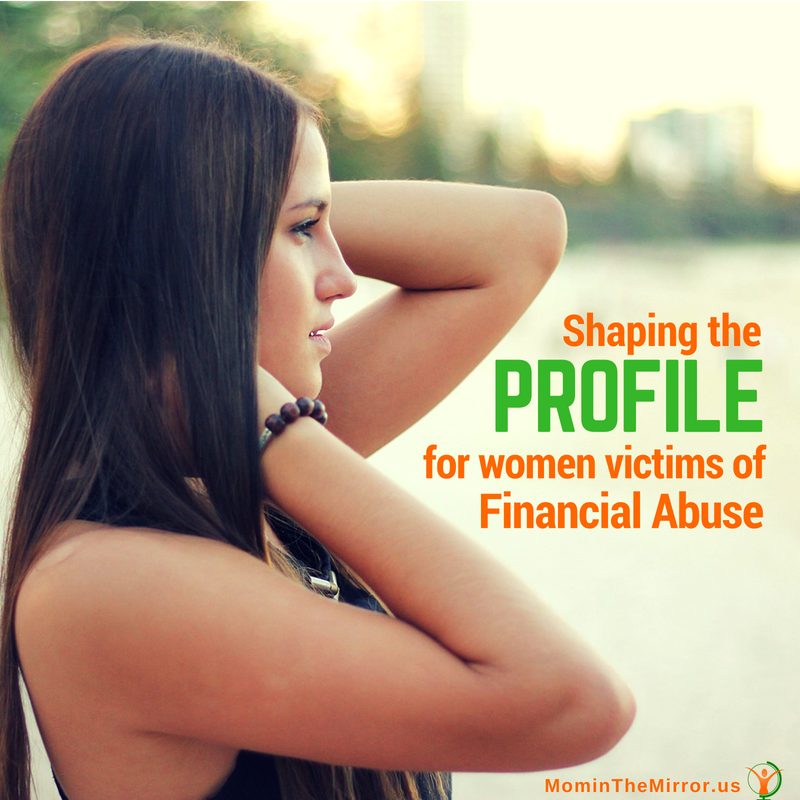 Do you think there is a profile for women victims of financial abuse? Which one of the different factors that affect our personality do you think that have had the biggest impact in your life? Share in the comments.